It’s hard to pin a person into one label, especially a child, yet we tend to be one way or another most of the time. By nature, introverted children are quieter and often labeled as “shy”. Extroverted children are the opposite and are thought to make friends easily, are comfortable and share often in class. Too much of either tendency causes concerns for parents and teachers, but often these personality dispositions are misunderstood. These terms were first coined by psychologist Carl Jung. 1)http://dictionary.reference.com/browse/introvert They describe whether a person turns inward or outward with their thoughts, feelings, and actions. What I don’t like about definitions that simplify these personality tendencies is they imply the introvert is selfish as their focus is inward. Not so! I see introversion as a potentially positive characteristic of someone comfortable with their being and grounded in the presence. I look at my own personal evolution and find I have developed more introversion as a result of spending time alone in nature, meditating and yoga. Should you be concerned if your child is an introvert? As the parent of a teenage introvert I would say no. We were sent the book Quiet Kids: Help Your Introverted Child Succeed in an Extroverted World by Christine Fonseca. Being an introverted child is difficult, especially in an ever-increasingly noisy world. Often viewed as aloof, unmotivated or conceited, introverted children are deeply misunderstood by parents, educators and even their peers. That’s where “Quiet Kids: Helping Your Introverted Child Succeed in an Extroverted World” comes in. 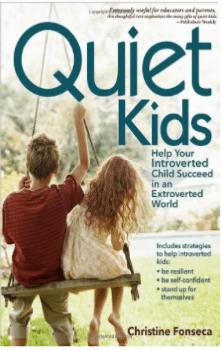 Designed to provide parents with a blueprint for not only understanding the nature of introversion, Quiet Kids provides specific strategies to teach their children how to thrive in a world that may not understand them. Presented in an easy-to-read, conversational style, the book uses real-world examples and stories from introverts and parents to show parents and educators how to help children develop resiliency and enhance the positive qualities of being an introvert. With specific strategies to address academic performance, bullying, and resiliency, Quiet Kids is a must read for anyone wishing to enhance the lives of introverted children. Parents of introverted kids often hear from teachers about how shy their child is in class. I have heard it many times. On the flip side, I also hear from educators that when my child speaks, the words are quite thoughtful and eloquent. There is something to be said for that! The question of concern is whether the introverted characteristics interfere with the child’s ability to experience the world. My daughter’s teacher has had to read her poetry in front of the class for her, yet she has performed guitar solos in the rock band in front of large crowds. Sure there is social anxiety, but the loving support of parents, educators, siblings, and friends makes all kids resilient. Introverts respond best when expectations are clear, boundaries are specific, and there are opportunities to connect to the family unit. Introverts need personal space and personal time to renew. Behavioral difficulties can arise when the introverted child becomes overwhelmed. Introverted children respond best to positive discipline, predictable routines, and authoritative parenting styles. I would argue all of those points would benefit extroverted children as well! I can attest my own introversion has been misunderstood as aloofness in the past. Some people have expressed I am hard to get to know. Others don’t find that a problem at all. Whether introversion or extroversion is present, what really matters is a person’s heart. We will all suffer from other people’s confusion or judgement at one time or another, but as long as we feel safe and secure in our heart, then we don’t need to be life of the party. I don’t like labels. I don’t like that extroversion is often seemed more a more favorable trait than introversion. We need to accept our children (and ourselves) for who we are and recognize the positive qualities that are naturally part of personalities. I could find no information from the publisher about the recycled content or source for the paper used in the production of this book. It is printed in the USA. « Why is there still asbestos in crayons? As an introvert who married an introvert and is about to have my first child, I very much appreciate this article! My only worry is that if our child is an extrovert we won’t know how to get him or her the socialization he or she needs!